I realize that it is not officially Fall yet but wanted to share this card I finished today. Cameron my Cameo was so happy to get to work cutting. Since the move everything has been a disaster so he has been neglected a lot. He does seem to be happy in his new home as I recently moved him into an old computer armoire. Once I found my supplies to do this technique from the August/September Technique Junkie newsletter I was happy also. 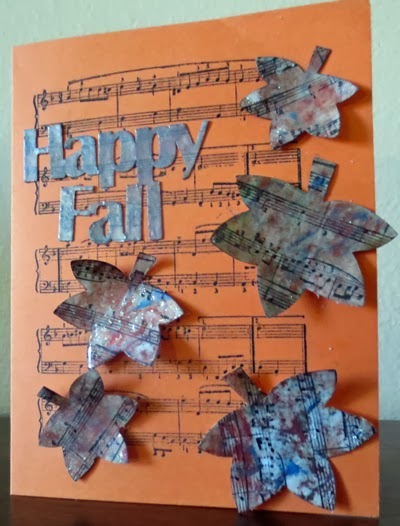 I don't remember what font I used for the Happy Fall sentiment. I welded the letters together in Studio. The leaves are from a Silhouette free file with a wood-grain heart. I deleted the heart and made the leaves different sizes. I followed the technique to color the sentiment and leaves substituting tube water color paints for the re-inkers. When my paints were dry I stamped with my music background stamp. To me music symbolizes happiness. I could not find my clear embossing powder and am thinking I must be out. On the sentiment I used a pearl translucent powder. It is alright and you can see the music through it. I just didn't care for the way it changed the colors. I was going to glue the leaves on as they were but then found my Ultra Thick Clear Enamel. I decided since I wanted the look of rain on the leaves to just use one coat. I curled the leaves a little bit before gluing them on. Originally I was going to use a pulled gelatin print for the background but didn't like how it looked with the leaves and sentiment. I decided instead to stamp on a blank card with the same music stamp. The prints can be used for another project and besides I had lots of fun making them. I am finally beginning to find things. I was happy this week to find my background stamps and my clear stamps. I still have a ton of organizing to do and things to find places for. A good friend will be delivering a shelving unit and desk for me next week. Hopefully before the New Year I will actually have a "playroom" to play in and won't spend all my time looking for things. I think my next project will be a banner with a Autumn theme. Fall or Autumn whichever you wish to call it is my favorite time of the year. The leaves fall and crunch under feet. The temperature is usually cooler than Summer but not as cold as Winter. It is that in between time of the year. It is the time of hayrides and going to the farm to pick out the perfect pumpkins. I can't wait to do that with my grandchildren this year. Ever since I can remember I have had a love affair with butterflies. My first garden as a child consisted of wildflowers I had planted to encourage the butterflies to come and visit. So Sunday when I decided to play with my gelatin plate some more it shouldn't surprise you that I decided to use one of my butterfly stamps during my play. Here is a card and envelope I transformed from a plain Jane into something elegant. I still have the inside to do on both the card and the envelope. The background was printed on a piece of erasable typewriting paper. I'm not even sure they still make it. I had placed it on the plate to clean the plate after pulling prints and loved how nice the print turned out that I kept it to use. Originally I was going to use a print I did on copy paper. The frame was cut out of a piece of blue typewriting paper that I found when packing up things for moving on a top shelf. It is left over from a few decades back when I was job hunting. I used the inner part of the frame to emboss the "Thinking" of You on. I wanted to emboss the sentiment and not the whole folder. My paper kept moving on me while I was embossing. I had just a little bit left and so I taped it on the folder with painter tape. I used a sharpie around the letters. Then took the darker color and went over the raised letters. My Sharpie ended up being a different color from the cap for the raised letters. Don't know if the wrong cap got put on it or what. Still I like the way they turned out because I think the letters pop now. 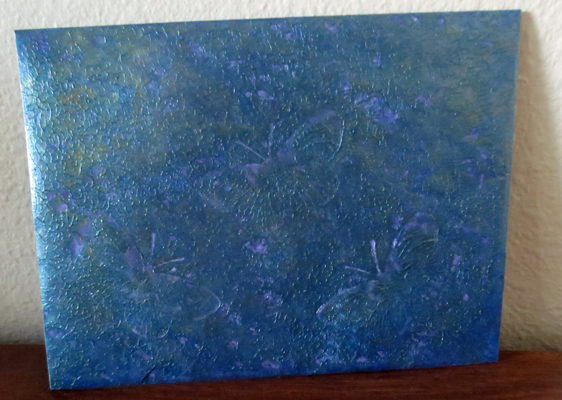 The butterfly was my first print of the day done on the erasable typing paper. I think the print ended up with a bunch of white blotches because the paint was too thick. I decided instead of throwing out the print to go ahead and see what happened when I cut it out in a shape. The erasable typing paper cuts like a dream. The tips of the antennae didn't cut all the way out but with this file that has been a problem every time I use it. One of these days I'll go in and edit the nodes. I found my gems so added a couple of gems. 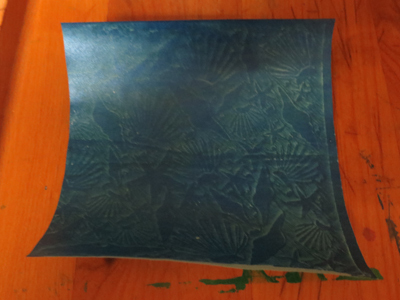 I decided to see if I could do an envelope on my gelatin plate. I did layering with paint and with different things. The paint ended up being thick which gave the envelope a nice textured look. Instead of using the butterfly stamp on the plate this time I stamped directly in the wet paint. I found it works best if the envelope is taken apart. So there you have creations using my prints. Notice that I used blue for a change instead of my signature purple. LOL! 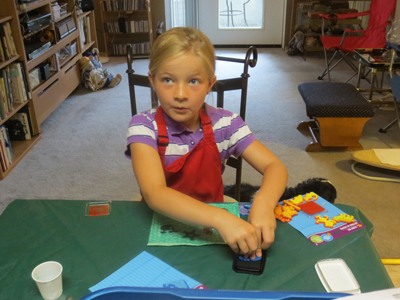 Have you tried playing with a gelatin plate yet? Do you have a color that you find yourself using a lot? I have some ideas for future projects including figuring out how to make a "Magic" card which my friend Alice sent me the link to the video for. I also have watched some videos for printing with the gelatin plate and have some techniques I want to play with. Since the weather is hot again this is a good time to play. Several months ago on the blog Golden Moments I won a magazine. Not only did Alice Golden send me the magazine I won but she sent me another one along with a box of goodies. She had written to ask if I had an embossing machine. When I told her I am the proud owner of a Big Shot she included several metal embossing folders and dies. When the box came although my apartment was in chaos from my move I started playing with some of the embossing folders and dies. 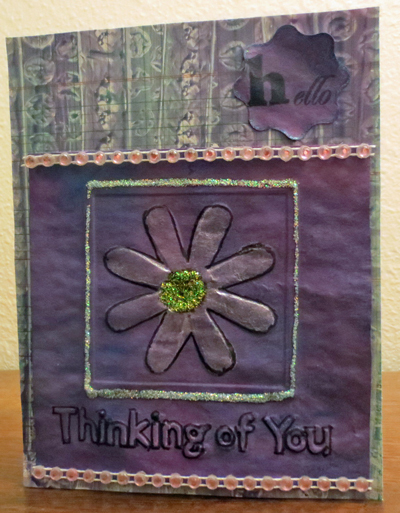 I had taken a square piece of card stock and embossed just the flower from the Thinking Of You embossing folder. I was going to use water colors on the embossed square but the borrowers were at it and the square disappeared. If you saw my playroom right now it would surprise you that I can find anything. Well I was looking at my papers pulled from my DIY Gelli plate and decided the first paper I had pulled experimenting with acrylic ink would be perfect for using the Thinking Of You embossing folder. The background paper is one I pulled Sunday. I used a piece of ledger paper to pull the print on. An organization was doing Spring cleaning and was giving away office supplies to anyone who would take them. When I saw the pad of ledger paper I knew that eventually I would find a use for it. crafting. I placed bubble wrap on my paint covered gelatin plate and removed it. Then I ran a roller stamp on the plate. The stamp was suppose to be two linked hearts but it doesn't look that way on the paper. 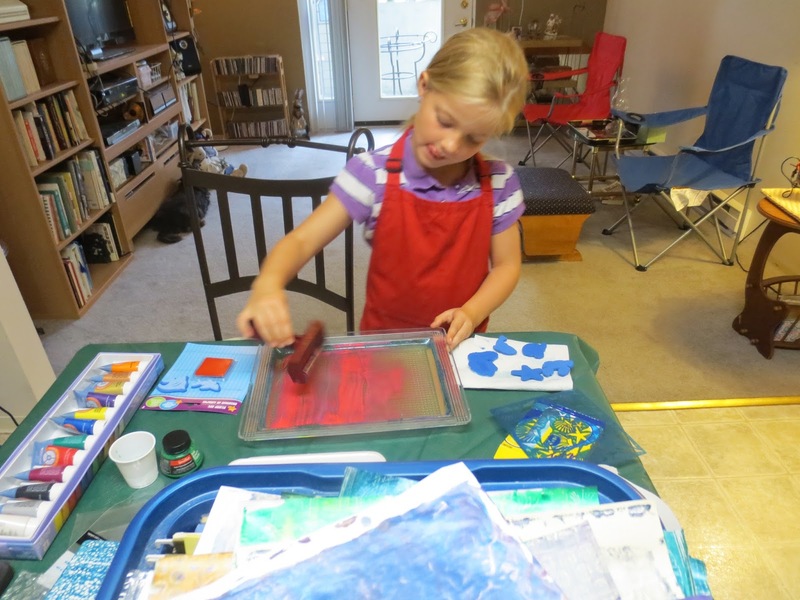 That is the fun of Gelli printing as you never know for sure exactly how a print is going to turn out. I wanted to use the Technique Tuesday H initial stamp set Alice sent and decided to cut a flower out of the same paper that I used for the embossed panel. I edged the flower using a gel pen. I cut a piece of my ink paper to size and embossed it. Then I took a metallic water color and painted the flower. Some of the paint got outside the lines but as A.J. Otto said there is no mistake it is suppose to look handmade. I took my black fine line Sharpie and drew around the petals. I also used it to draw around the letters giving them a little more definition. I made some dots in the center of the flower with a couple of gel pens but didn't like how it looked. I took my green Stickles and made dots with that. Then with aqua Stickles I went around the edge of the frame. Given my poor lighting it was hard to see the embossed frame so my lines aren't perfect but after all it is a handmade card. I finished the embossed panel by applying bead ribbon I had bought on sale awhile ago. It was suppose to be self adhesive but isn't. No big problem as a glue stick applied to the back is perfect for adhering it to projects. On Facebook someone recently asked if anyone sent mail these days. Not e-mail but the old fashioned mail that you actually have to drop in a letter box or drop off at a Post Office. Sadly most of the comments were that they did not because it was quicker to send an email and cheaper. To me this is sad. Have you mailed anything besides checks to pay your bills lately? Thank you for stopping by and looking. I'm off to check out some ideas for invitations and party decor just in case I'm taken up on an offer to supply those things for a party next month. So if you don't see me for awhile you will know that I'm knee deep in crafting. Either that or lost in the playroom in which case you better call someone to come looking for me. Besides dabbling in crafting and pretending to be an artist ;-) I also love to take photos to record a moment in time. 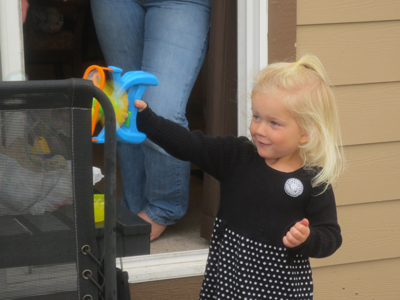 Yesterday was the perfect day when Ali came over to play with Grandma and later when I went to have dinner with them. 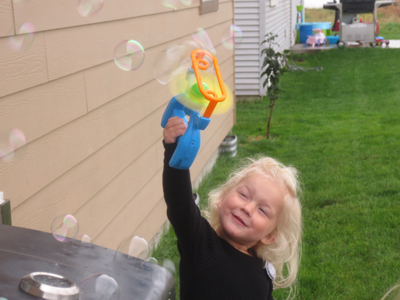 Oh yes, Grandma had to take her bubble machine to dinner and oh boy did we have fun. Lots of laughs. I am not a professional photographer but I love some of the pictures I took yesterday. So grab a cup of coffee and relax as you scroll through this post. 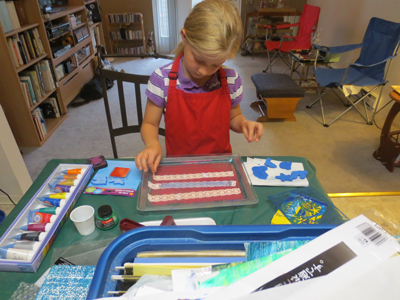 Ali had pulled several prints off of the Gelli plate before I remembered I wanted to take some photos. Luckily I found the box I had packed my brayer in as it made applying the paint easier for her. She used acrylic metallic paints for most of the prints she pulled. She did use the tube water color paints successfully also as well as the acrylic ink. Here she is placing lace in the wet paint. She did two different prints with the lace . One with rice paper and one with regular copy paper. The copy paper gave a crisper image. It is also sturdier when wet. Later on we will make some wrapping paper using this method. Will be interesting to see how brown wrapping paper works. Also we will do more experimenting using different things. 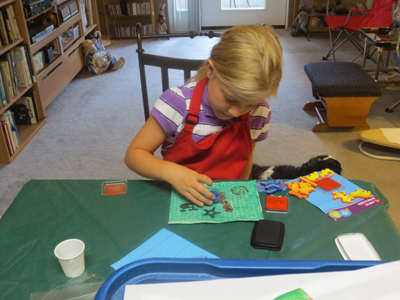 Here she is inking another stamp to stamp on her bubble wrap "Gelli" print. 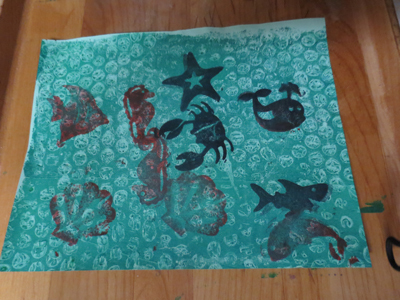 She thougth Grandma was crazy ironing the paper after it dried until she noticed that the paper was flatter so she could stamp. Here she is stamping more images on the print. Here is her completed piece. Both Ali and I love the wonderful texture that bubble wrap gives. This was done on a piece of copy paper. This was an experiment. Ali first rolled on acrylic ink. Then rolled on a thicker acrylic paint. She then placed a stencil in the paint. She removed the stencil and used a piece of rice paper. This was the resulting print. The paper curled up but I think I can flatten it by placing it under a stack of books. The paper had a crease in it before she placed it in the paint but I think it gave the print more character. I'm not sure how she is going to use this print yet. Perhaps I'll use my Cameo and cut out some print and cut fish for her to pop dot on it and we can frame it. 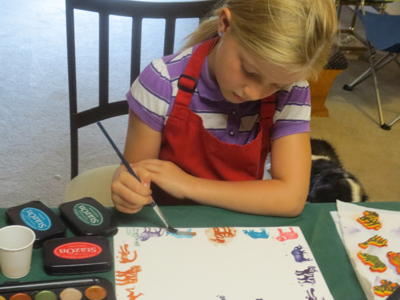 I gave Ali a piece of water color paper and she stamped with foam stamps I found at the dollar store with Stazon ink. 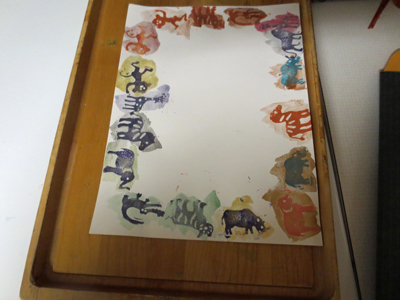 Then she took my pan metallic water colors and painted over the stamped images. I explained to her how different inks are used for different things. If she had used the ink she used on her bubble print the images would have smeared when she applied the water colors. She was amazed to see that the water colors did not change the color of the stamped images. This is her finished piece. The picture does not do her artwork justice as you can not see the shimmer from the paints. She is planning to add small photos to this. It will be interesting to watch her grow as an artist and a crafter. Right now her parents are checking to see if there are any art classes she can take. This is Bug my mischievous granddaughter. 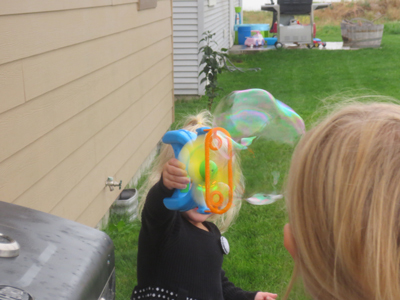 Here she is pointing the bubble machine towards me. 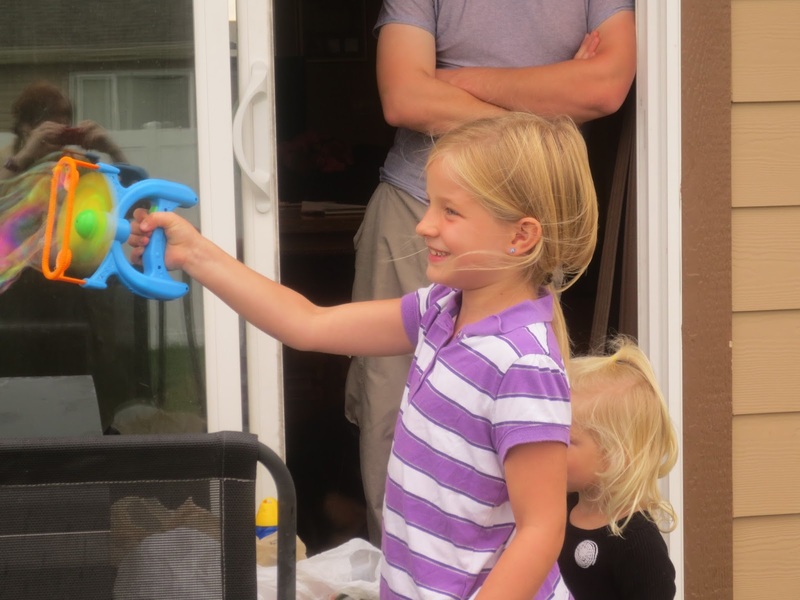 This girl is so full of energy and you never know what she is going to do next. 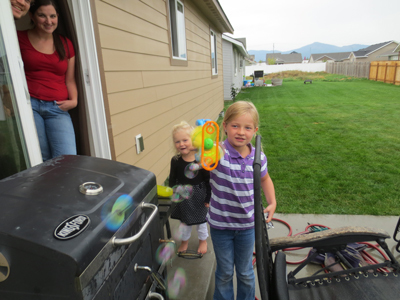 Here Bug is bubbling Big Sister. Heaven help us if she ever gets a paint gun in her hand. LOL! This is my favorite picture. I love when I get shots like this. Especially since I keep forgetting that I can set my camera to take multiple pictures. Now it is Ali turn and you can tell she is not going to show Grandma any mercy. This is one girl you don't want to mess with. Although she can be girly for the most part she is tom boy. 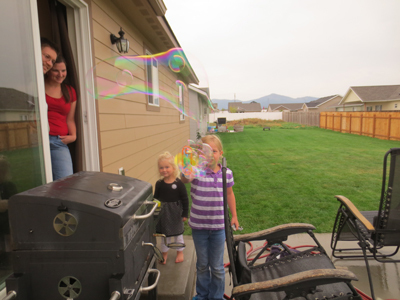 The parents had fun watching the girls and the bubbles float in the air. You can tell that Ali is intent on bubbling Grandma. I finally had to go stand behind the girls and then I still wasn't safe. It was good clean fun and since it was sprinkling outside I did not have to come home and take a shower after chasing Bug around in the house. The Summer break is over and I think this was the perfect way to end it for the girls. I wish them well as they start a new school year. Now grandma has to get busy and make a mini album full of pictures for the girls of our fun summer time. I think it will be the perfect Christmas gift for them. Thank you for visiting and do come back. 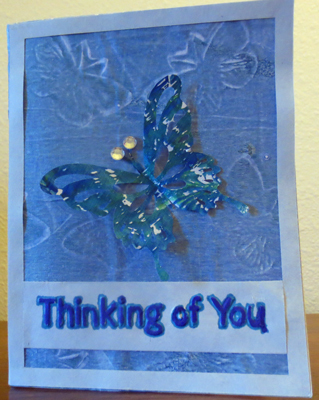 I am working on a card for a dear friend using some of my pulled prints and a embossing folder.